– September 30, 2012Posted in: SusieQ FitLife Breaking News, SusieQ FitLife Updates! Health Benefits of Walnuts on SusieQ FitLife! The importance of conditioning your body is as essential as feeding your mind! In this case we are referring to brain power with protein packing BRAIN FOOD. The easiest thing someone can do for more energy and refueling the body between their workout sessions or simply being over worked, at work is to recharge the body and fuel mind! Raw walnuts are nature’s great gift to the body if non-allergic! Walnuts have the highest levels of antioxidants in the Nut Family! To better control your behavior, emotions, thought processes and mood consistency you need to carefully select the food you choose to eat that will determine the quality of your FitLife! Nourishing a healthy mind strongly depends upon the electrical chemical activity in your brain. Essential fatty acids such as Omega 3’s & Omega 6’s help the brain to function. This is one wise snack decision you can make in the raw form. This is a dairy-free & gluten-free food product. These nuts are a high-quality protein that has also been known to substitute meat, dietary fiber with all the vitamins & minerals it naturally contains! Consuming small portions on a regular basis may decrease the risk of heart disease, certain cancers, gallstones, metabolic syndrome, Type 2 diabetes & other health problems. At the end of the day the best gift that you can give yourself is to be aware of everything you are putting in your mouth. The body never lies and it will reflect what you choose to feed it; which will directly impact your moods and clarity of thinking. This week on Watch Your Mouth Wednesday, whether or not fruits can save your Un-FitLife or FitLife! You’ll find out the top 5 favorite fruits from some of our FitLifers! Be sure to participate in our Brain Teaser Games with our FitLife Family on Facebook and our site! In the meantime, Watch Your Mouth & Get a FitLife! 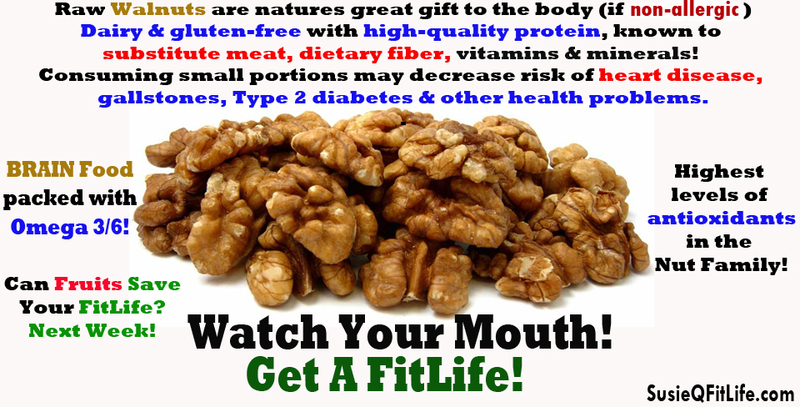 The Truth About Walnuts On SusieQ FitLife!